El Nino/ La Nina El Nino is a disruption of the oceanic and atmospheric systems off the coast of South America that causes unusually warm water temperatures, a shift in the direction of the winds, changes in currents, and significantly increased rains. The increased rainfall leads to destructive flooding in the eastern Pacific, while at the same time causing drought in the western Pacific, all the way to Australia. Fishermen in Chile and Peru who noticed that the surface temperature of the coastal water Christmas Island and all the way up to California, in the USA. Studies have shown that El Nino can last for periods of eighteen months or more, and that it returns, on average, every five to seven years. La Nina, meaning “little girl,” refers to the opposite occurrence, a “cold event,” when water on the equator is unusually cold. El Nino is predicted by monitoring changes in water temperature on the surface of the sea, wind conditions, and currents near Ecuador and Peru. During El Nino, the trade winds slow in the central and western Pacific causing the warmest water to shift to the east, which in turn results in major changes in atmospheric changes around the globe forcing weather changes throughout the world. When the warm water shifts east, the cold water thermocline layer near South America drops lower, sometimes reaching a depth of close to 150m (500ft). The lack of nutrients causes reproduction at lower levels of the food web to decline, which rapidly affects the higher levels of the food web. In Galapagos waters, hammerheads and other species move into deeper, cooler waters, corals bleach white and giant barnacles die. 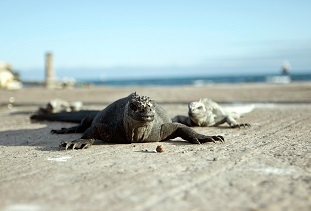 On land, many seabird species don’t breed and populations of marine iguanas are severely reduced. Land animals that feed on plant food do well during El Nino, however. Galapagos giant tortoises grow more than usual because of the abundant vegetation. 2011 The devastating El Nino of 1982-83 saw almost six times as much rain as normal in the Galapagos and created a wildlife catastrophe. Set off an explosion of plant growth that contributed to the spread of introduced species, such as fire ants and rats, which then attacked the endemic animals. Seabirds, like this swallowtail gull, rely on food from the ocean to survive and are adversely affected by an El Nino event. Instrumentation placed on Buoys in the Pacific Ocean after the 1982-1983 El Niño accurate data gathering.